Whilst my back was turned for a weekend away some bright tulip colour quietly crept in and took me by surprise on my return this afternoon. I make no secret that I have a love/hate relationship with tulips - love the flowers and hate the leaves. I think that the bulbs pick up on my vibes so don't usually perform well. Sadly my autumnal bulb planting schedule went out of the window last year, so nearly all of my hopes in the tulip department have been pinned on bulbs that were planted in pots in the autumn of 2015. After flowering the pots were unceremoniously shoved at the back of the greenhouse and have been left to their own devices ever since. They have rewarded me with what seems the earliest ever tulips in flower so of course a trio of stems had to be snipped to leap in to this week's 'In A Vase On Monday'. Unless the squirrels have been playing musical labels I'm reasonably sure that these are 'Orange Emperor'. 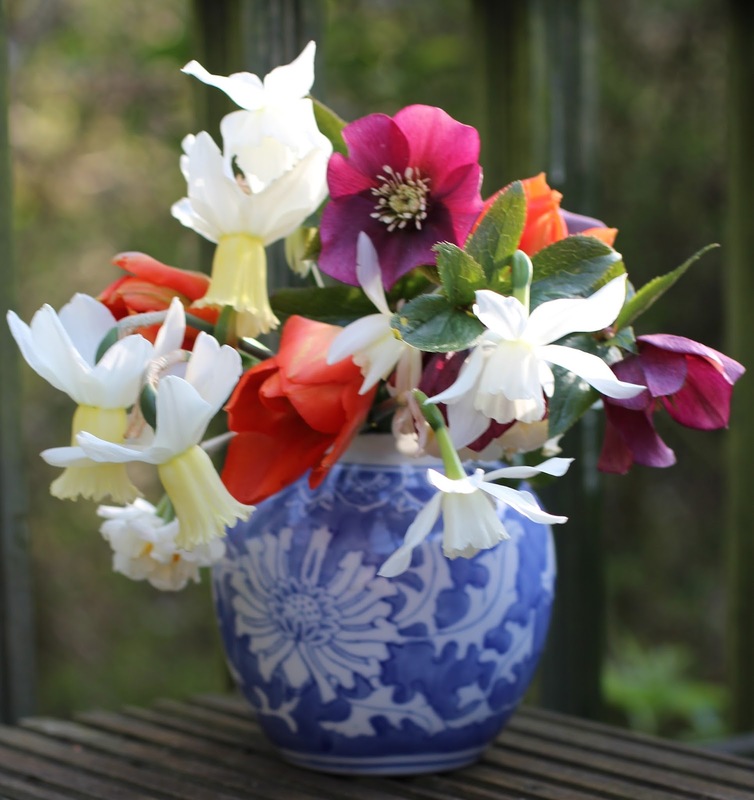 Along with them a stem of a hellebore (name unknown,very tall stems) together with a trio of narcissus - 'Thalia', 'WP Milner and sweet scented 'Bridal Crown'. I'm not sure whether I've shown the vase on a blog post before. It's a fairly recent find from a charity shop and it's Chinese. That's all I can tell you about it. I wasn't sure whether I would get a vase together today but then I remembered that magical extra hour of daylight that we have gained, so there has been time to catch up with some domestic chores and still time to play. Thanks as always to Cathy over at 'Rambling At The Garden' for her unwavering prompt to celebrate the start of a new week with some flowery goodness. In A Vase On Monday ~ Sink Or Swim? My 'In A Vase On Monday' this week is in fact a bowl into which I've tried to float a quartet of hellebore flowers, hoping that they would artistically drift atop of the water. So far they are being rather wayward, hence the title of my post. It could be the fact that they were wet when picked that is dragging them down into the deep briny. Not content with chucking wet suff down most of the weekend, the skies continued to weep again this morning but the sun has come out this afternoon to celebrate the first day of spring. Yaaaaaaaaaaay! The flowers have been picked from a plant that has been in the garden for years, from a self-seeder and from two newcomers purchased since the start of the year. I did vow not to buy all more hellebores this year but like snowdrops I find them hard to resist. Helleborus 'Madame Lemonnier' (bottom left) is the first newcomer carrying outward facing dusky-pink flowers. The majority of the flowers are conspicuous by their sheer size but this is one of the plant's smaller flowers. The second newcomer is Helleborus 'Angel Glow' (bottom right), which seems to have been fed on a diet of steroids going by the sheer volume of flowers it has produced. The Portmeirion bowl was a serendipitous find that emerged as we were clearing my mother's house. The exterior is an intense deep blue whilst the inner surface has a iridescent glaze of pale blues, soft greens and turquoise which has had me bewitched from the moment I set my eyes on it. Thanks as always to Cathy over at 'Rambling In The Garden' who provides the inspiration to come up with a weekly vase each Monday. I see that Cathy is very much in the pink this week celebrating the landmark anniversary of five years of blogging. Do pop in and say hello to her either with or without a vase and be sure of a warm welcome. 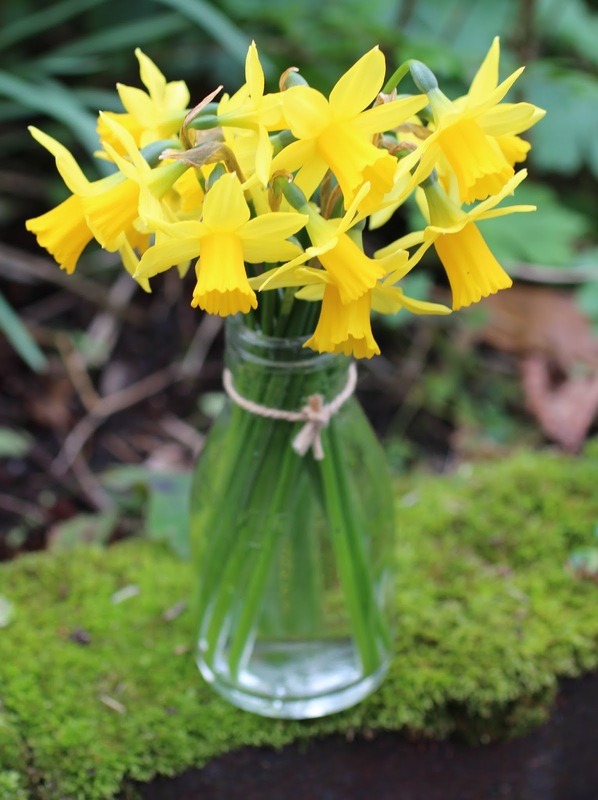 It's a definite thumbs up for narcissus 'Tête-à-Tête', which are filling up this week's 'In A Vase On Monday' and are now brightening up the kitchen windowsill. Whilst a good number of my daffodils are 'blind' this year, this old stalwart is as floriferous as ever whether planted in the ground or in containers. I'm especially appreciate of them as a good number of them were purchased as late season bargain buys from Wilkos. A note has been made to add to their numbers this autumn as well as to give some t.l.c. to the afflicted daffies in the hope of better things to come next year. Thanks to the lovely Cathy over at 'Rambling In The Garden' for the weekly encouragement to fill a vase on a Monday. Domestic duties call for now but am looking forward to some vase visiting this evening. 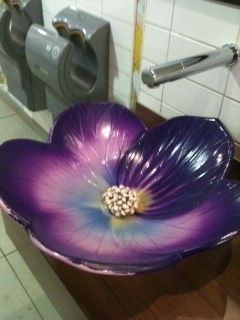 In A Vase On Monday ~ Would You Adam and Eve It? Yes it's already that time of year when they are subtly making their presence known. 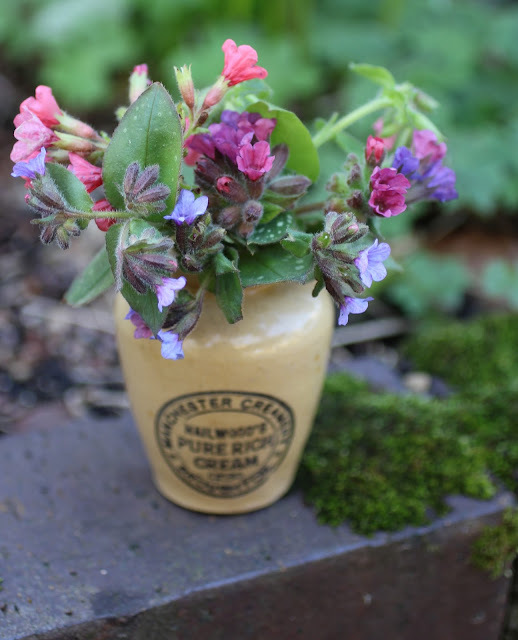 I'm refering to pulmonarias or lungwort, also known as 'Adam and Eve', 'Soldiers and Sailors', and 'Bethlehem Sage' are one of my favourite late winter/early spring flowers. As well having flowers which are bee magnets their foliage is equally desirable coming in a variety of shades of soft apple green, darker greens, silvers and as well as spotty dotty. Today's 'In A Vase On A Monday' is a trio of three pulmonarias - one that I can't put a name to, 'Rubra Redstart' which is now really going over and finally 'Victorian Brooch' which leapt in to my basket last week when I was supposed to be seed potato shopping. They prefer moist, partially shaded conditions and respond well to a shearing in late spring producing a second flush of foliage. They are excellent companion plants for snowdrops, hellebores and little daffs. I don't think that they will last long in a vase but still it's good to be able to study them at close quarters albeit briefly. Thank you as always to the lovely Cathy over 'At Rambling In The Garden' for hosting. P.S. Many apologies to those of you who tried to comment last week and who were initially thwarted (both Blogger and Wordpress users). I really don't know what's going on but changes here are afoot! Watch this space. Today's post has been inspired by Michelle over at 'Veg Plotting'. I've being making use of some welcome dry sandwiched between the wet to spend some time in the garden. Amongst other activites I've been debating whether I can cram any more into our green waste bin, before its first much anticipated emptying of the year on Friday. I can see it being full again by the end of next weekend. The top layer reveals recent activities - belated removal of old hellebore leaves, cleaning up debris left behind by that femme fatale 'Doris' and evidence of a tussle with a truculent string of clover stem. I've been wondering about the gap in the middle of this pan of crocus sieberi 'Firefly'. I definitely planted bulbs there! I've been despairing over the stinging nettles, ivy and cow parsley that are creeping in, noting the blind daffodils and chastising myself for not picking up last year's leaf fall. I've been admiring how some hellebore plants are bulking up and deciding that this patch of cardamine pratense definitely needs dividing sooner rather than later - just need to research when. I've made a start on planting one hundred eranthis hyamelis and continuing with the annual sycamore seedling cull. I've been pleasantly surprised by the emergence of the aptly named galanthus 'Baxendale's Late' which I had forgotten I planted last year. It's about to open now that the most of my other specials are shutting up shop. I've been gazing intently at my sweet peas in the greenhouse in the hope that it will make more of the seeds germinate. Above all I've had some much welcome fun in my garden today. Why not join in Michelle's imaginative challenge to share what's going on in either your garden or allotment right now. You can either blog or post a photo on Instagram or Facebook or Twitter making sure that you use the #mygardenright now hashtag. You can take participate either today or tomorrow. Full details of how to join in can be found here. I'm off out again whilst there is still daylight out there, but will return later to browse upon what other other folk are up to in their patches of earth right now. "The Mole had been working very hard all the morning, spring-cleaning his little home. First with brooms, then with dusters; then on ladders and steps and chairs, with a brush and a pail of whitewash; till he had dust in his throat and eyes, and splashes of whitewash all over his black fur, and aching back and weary arms. Spring was moving in the air above and in the earth below and around him, penetrating even his dark and lowly little house with its spirit of divine discontent and longing. It was small wonder, then, that he suddenly flung down his brush on the floor, said "Bother!" and "O Blow!" and also "Hang spring-cleaning!" and bolted out of the house without even waiting to put on his coat. Something up above with calling him imperiously, and he made for the steep little tunnel which answered in his case to the gravelled drive owned by animals whose residences are nearer to the sun and air. So he scraped and scratched and scrabbled and scrooged, and then he scrooged again and scrabbled and scratched and scraped, working busily with his little paws and muttering to himself, "Up we go! Up we go!" till at last, pop! his snout came out into the sunlight, and he found himself rolling in the warm grass of a great meadow. "This is fine!' he said to himself. "This is better than whitewashing!" The sunshine struck hot on his fur, soft breezes caressed his heated brow, and after the seclusion of the cellarage he had lived in so long the carol of happy birds fell on his dulled hearing almost like a shout. Jumping off all his four legs at once, in the joy of living and the delight of spring without its cleaning, he pursued his way across the meadow till he reached the hedge on the further side." 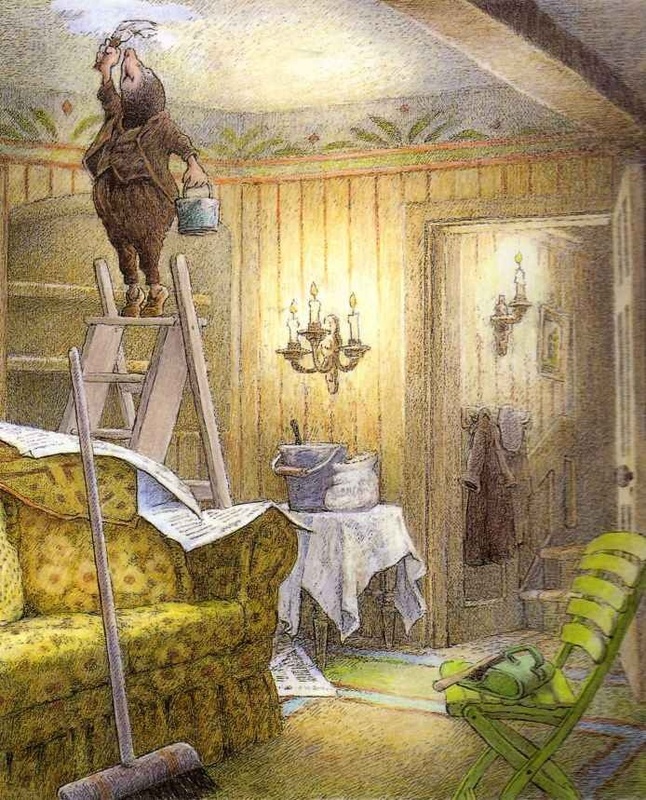 ~ from 'The Wind in The Willows' ~ Kenneth Grahame. Spring is definitely"moving in the air above and the earth below and around" here too. It's not arrived quite yet but the first of March means that it's tantalisingly near. Time for me to very belatedly start my spring-cleaning in the greenhouse before another growing season really kicks in. Have you completed all your preparations?